This is an oldie, but a goodie! My second child is nearly the same age now as my first was when we did this one, so it will work even for tiny tots. Definitely worth a try, y’all! 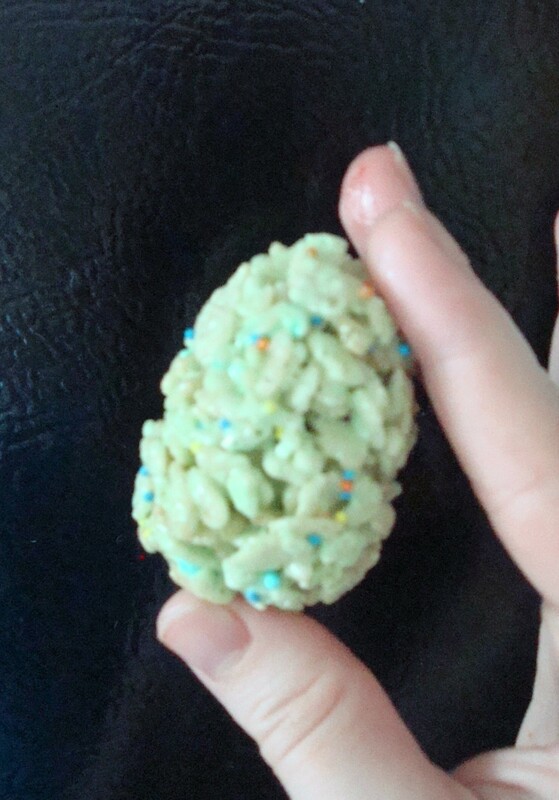 One of the things we chose to do was Easter Egg Rice Cereal Treats, with our own twist. We used key lime flavored marshmallows and added lots of pretty colored sprinkles in with the rice cereal. We didn’t fill them or decorate them extra, since that was just too much to try to get accomplished with my dawdly darling during my little punkin’s nap. 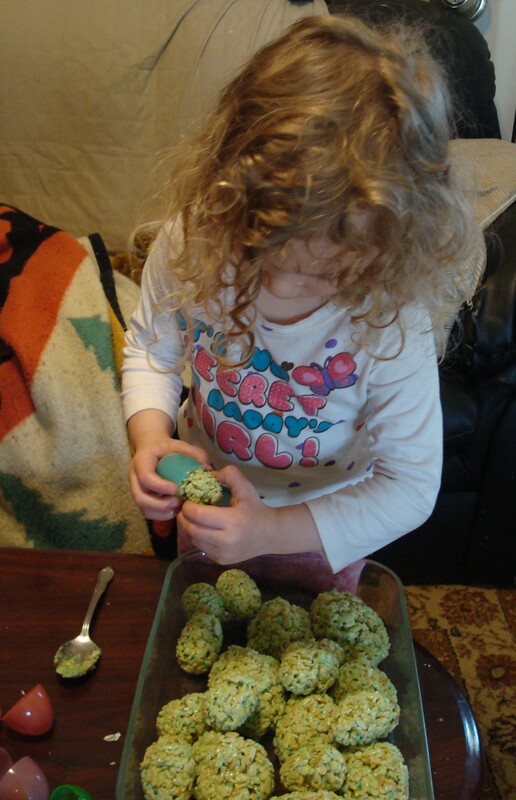 We were having oodles of fun doing a basic molded version, plus some that we shaped into eggs by hand, and that’s the main point of doing cooking or crafts with a munchkin. They turned out with the refreshing look and taste of spring, and my daughter is quite pleased with our handiwork. Add rice cereal and candy sprinkles. Stir until well coated. Using greased hands, firmly press 1/4 cup of the cereal mixture into each Plastic Easter Eggs half. Press together. Remove from molds. Place on wax paper. Using 1/3-cup measuring cup coated with cooking spray divide warm cereal mixture into portions. Using buttered hands shape each portion into egg shape. Cool. Decorate with frosting and/or candies, if desired. For a cute way to store these once they cool, try this cute Easter Egg Shaped Chick Cookie Jar or this Easter Tupperware ! Princess and I got most of this done before my littlest booger woke up from his nap. Being the food loving fella that he is, he awakened just in time for the most important part of any recipe: taste testing! What flavor of marshmallows will you use in yours? For another fun Easter recipe, try my Peeps Easter Candy Cake! Categories: Frugal Family, Living Life | Tags: budget holiday, cooking with children, easter egg ideas, Easter eggs, rice krispies, rice krispy easter eggs | Permalink. Saw your comment on voiceboks and Im glad I did! Just reading a few of your recent posts I already see enough to bring me back! I love that you shop at a thrift store and I can recognize that Lowes cart in a heartbeat! I have a 2 y/o girl and a 9 month old boy so Im definitely used to the occasional meltdown! Anyway, I never even knew there were key lime flavored marshmallows and now I must go find them! My husband is such a kid and LOVES rice krispie treats.. and he loves key lime pie. I may have stumbled upon a goldmine here! lol Take care!